Some teachers are turning to gadgets like this hand-held graphing calculator by Texas Instruments to make math more interesting. HOPING to make math cool, some educators here and on the mainland are betting on iPod-like calculators, TV shows and other technology to hook kids into the subject and help teachers explain problems. The goal is to have schoolchildren use their speedy fingers to not only text-message and download music, but also solve equations, draw graphs and eventually improve test scores. That was the talk this weekend among about 300 public and private isle instructors during a two-day workshop at Sacred Hearts Academy. 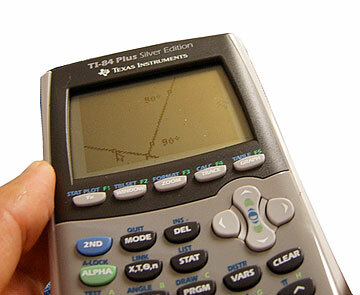 Texas Instruments, regarded as a leader in graphing calculators, was one of the companies showcasing its latest products, including the TI-Navigator system, a network of interconnected hand-held devices. The system lets a teacher simultaneously look at the steps students are taking to solve assignments in a computer screen. The teacher can then display right and wrong answers on a projector to discuss them with all students at once, saving instruction time and increasing participation. "There's always kids who don't participate. They are either shy or afraid to show they don't understand what is being explained," said Linda Beheler, TI's director for branding and communications. With the program, she said, "the teacher can see which kids are getting, understanding the concept and which kids aren't." The program, which costs about $3,000 a classroom set, helped improve test scores for 33 percent of students at Lake Highlands Junior High, a Texas public school with a large population of economically disadvantaged seventh- and eighth-graders. There are similar pilot projects in four other school districts nationwide, Beheler said. TI also partnered with the CBS TV show "NUMB3RS" -- in which an FBI agent and his mathematician brother solve crimes -- to show students real-life applications of math. As many as 43,000 teachers across the country have used material related to the series, Beheler said. Dewey Gottlieb, a state Department of Education math resource teacher for the Leeward District, said about 11 schools got high-tech calculator programs through a federal No Child Left Behind grant. But beside finding the time to write grant proposals to buy the equipment, some teachers who are used to blackboard and chalk need constant training to become comfortable with the technology and use it in the classroom. For that, the Leeward schools involved in the three-year grant are getting training from University of Hawaii researchers. "It really takes you out of your comfort zone," said Gottlieb, a former math teacher at Pearl City High School who now holds professional development sessions. "The teachers will see the value of it, but then, dealing with the students, you need some ongoing support." Still, educators believe technology advancements in teaching are key to make math more relevant to students and bring up their scores in the Hawaii State Assessment test, where current results do not "look very promising," according to Gottlieb. In last year's public school test results, only 25 percent of eighth-graders and 18 percent of 10th-graders were proficient in math. By the last year of the NCLB grant, Gottlieb expects some teachers to have the TI-Navigator, which he ranks among the best and most user-friendly systems on the market.